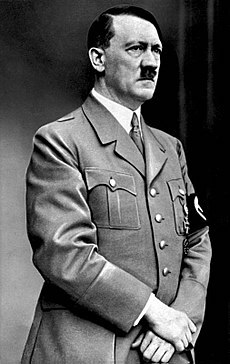 Adolf Hitler (Jerman: [ˈadɔlf ˈhɪtlɐ] ( danga); lahia 20 April 1889 – maningga 30 April 1945 pado umua 56 taun) adolah surang politisi Jerman dan marupoan pamimpin Partai Nazi (Jerman (NSDAP); Partai Pekerja Jerman Sosialis Nasional) kalahiaran Austria. Inyo manjabaik sabagai Kanselir Jerman sajak 1933 sampai 1945 dan diktator Jerman Nazi (bagala Führer und Reichskanzler) mulai taun 1934 sampai 1945. Hitler manjadi pamimpin utamo Jerman Nazi, Parang Dunia II di Eropa, dan Holocaust. Aigner, Dietrich (1985). "Hitler's ultimate aims – a programme of world dominion?". di dalam Koch, H.W. Aspects of the Third Reich. London: MacMillan. ISBN 978-0-312-05726-8. Bonney, Richard (2001). "The Nazi Master Plan, Annex 4: The Persecution of the Christian Churches". Rutgers Journal of Law and Religion. http://www.leics.gov.uk/the_nazi_master_plan.pdf. Diakses pado 7 Juni 2011. Gellately, Robert (1996). "Reviewed work(s): Vom Generalplan Ost zum Generalsiedlungsplan by Czeslaw Madajczyk. Der "Generalplan Ost." Hauptlinien der nationalsozialistischen Planungs- und Vernichtungspolitik by Mechtild Rössler; Sabine Schleiermacher". Central European History 29 (2): 270–274. doi:10.1017/S0008938900013170. Hancock, Ian (2004). "Romanies and the Holocaust: A Reevaluation and an Overview". di dalam Stone, Dan. The Historiography of the Holocaust. New York; Basingstoke: Palgrave Macmillan. ISBN 978-0-333-99745-1. Hitler, Adolf (1973) . Roussy de Sales, Raoul de. ed. My New Order. New York: Octagon Books. ISBN 978-0-374-93918-2. Hitler, Adolf (1942). Baynes, Norman H.. ed. The Speeches of Adolf Hitler, April 1922 – August 1939. London: Oxford University Press. ISBN 978-0-86527-493-8. Jamieson, Alastair, "Nazi leader Hitler really did have only one ball ", 19 Nopember 2008. Diakses pado 27 Mai 2011. Keller, Gustav (2010) (dalam bahaso German). Der Schüler Adolf Hitler: die Geschichte eines lebenslangen Amoklaufs [The Student Adolf Hitler: The Story of a Lifelong Rampage]. Münster: LIT. ISBN 978-3-643-10948-4. Koch, H. W (June 1988). "Operation Barbarossa – The Current State of the Debate". The Historical Journal 31 (2): 377–390. doi:10.1017/S0018246X00012930. Messerschmidt, Manfred (1990). "Foreign Policy and Preparation for War". di dalam Deist, Wilhelm. Germany and the Second World War. 1. Oxford: Clarendon Press. ISBN 978-0-19-822866-0. Overy, Richard (1999). "Germany and the Munich Crisis: A Mutilated Victory?". di dalam Lukes, Igor; Goldstein, Erik. The Munich Crisis, 1938: Prelude to World War II. London; Portland, OR: Frank Cass. OCLC 40862187. Overy, Richard (1999). "Misjudging Hitler". di dalam Martel, Gordon. The Origins of the Second World War Reconsidered. London: Routledge. pp. 93–115. ISBN 978-0-415-16324-8. Rißmann, Michael (2001) (dalam bahaso German). Hitlers Gott. Vorsehungsglaube und Sendungsbewußtsein des deutschen Diktators. Zürich München: Pendo. ISBN 978-3-85842-421-1. Robertson, E. M. (1985). "Hitler Planning for War and the Response of the Great Powers". di dalam H.W, Koch. Aspects of the Third Reich. London: Macmillan. ISBN 978-0-312-05726-8. Steinberg, Jonathan (June 1995). "The Third Reich Reflected: German Civil Administration in the Occupied Soviet Union, 1941-4". The English Historical Review 110 (437): 620–651. doi:10.1093/ehr/CX.437.620. OCLC 83655937. Weinberg, Gerhard (December 1955). "Hitler's Private Testament of 2 May 1938". The Journal of Modern History 27 (4): 415–419. doi:10.1086/237831. OCLC 482752575. Weinberg, Gerhard (December 1964). "Hitler's Image of the United States". The American Historical Review 69 (4): 1006–1021. doi:10.2307/1842933. Wilt, Alan (December 1981). "Hitler's Late Summer Pause in 1941". Military Affairs 45 (4): 187–191. doi:10.2307/1987464. Bazyler, Michael J. (25 December 2006). "Holocaust Denial Laws and Other Legislation Criminalizing Promotion of Nazism" (PDF). Yad Vashem. http://www1.yadvashem.org/yv/en/holocaust/insights/pdf/bazyler.pdf. Diakses pado 7 Januari 2013. "Parkinson's part in Hitler's downfall ", (BBC News), 29 Juli 1999. Diakses pado 13 Juni 2011. "1933 – Day of Potsdam". City of Potsdam. http://www.potsdam.de/cms/beitrag/10000945/33981/. Diakses pado 13 Juni 2011. "Documents: Bush's Grandfather Directed Bank Tied to Man Who Funded Hitler ", (Fox News), 17 Oktober 2003. Diakses pado 16 Oktober 2011. "Hitler's Last Days". mi5.gov.uk. MI5 Security Service. https://www.mi5.gov.uk/home/mi5-history/world-war-ii/hitlers-last-days.html. Diakses pado 5 Januari 2012. Evans, Richard J., "How the First World War shaped Hitler ", (Phillip Crawley), 22 Juni 2011. Diakses pado 23 September 2012. Frauenfeld, A. E (August 1937). "The Power of Speech". Calvin College. http://www.calvin.edu/academic/cas/gpa/machtrede.htm. Diakses pado 19 Oktober 2011. Glantz, David (11 October 2001). "The Soviet‐German War 1941–45: Myths and Realities: A Survey Essay" (pdf). Clemson, SC: Strom Thurmond Institute of Government and Public Affairs, Clemson University. http://sti.clemson.edu/index.php?option=com_docman&task=doc_details&gid=189&Itemid=310. Diakses pado 12 Desember 2012. Goebbels, Joseph (1936). "The Führer as a Speaker". Calvin College. http://www.calvin.edu/academic/cas/gpa/ahspeak.htm. Diakses pado 19 Oktober 2011. Hinrichs, Per, "Des Führers Pass: Hitlers Einbürgerung [The Führer's Passport: Hitler's Naturalisation]", (Spiegel Online), 10 Maret 2007. Diakses pado 16 Oktober 2011. Kotanko, Florian. "House of Responsibility". http://www.hrb.at/index.php?path=languages/english/body.php. Diakses pado 8 Januari 2013. "Introduction to the Holocaust". United States Holocaust Memorial Museum. http://www.ushmm.org/wlc/article.php?lang=en&ModuleId=10005143. Diakses pado 17 Oktober 2011. "Eingabe der Industriellen an Hindenburg vom November 1932 [Letter of the industrialists to Hindenburg, November 1932]". Glasnost–Archiv. http://www.glasnost.de/hist/ns/eingabe.html. Diakses pado 16 Oktober 2011. McMillan, Dan (October 2012). "Review of Fritz, Stephen G., Ostkrieg: Hitler's War of Extermination in the East". H-Genocide, H-Net Reviews. http://www.h-net.org/reviews/showrev.php?id=35868. Diakses pado 16 Oktober 2012. "[The Hitler Trial Before the People's Court in Munich]" (dalam bahaso German) Der Hitler-Prozeß vor dem Volksgericht in München. 30 Maret 1924. Office of Strategic Services (1945). "The Nazi Master Plan: The Persecution of the Christian Churches". Rutgers Journal of Law and Religion (Ithaca, NY: Cornell Law Library): 6–7. OCLC 320083040. http://org.law.rutgers.edu/publications/law-religion/nurinst1.shtml. "Hitler ersucht um Entlassung aus der österreichischen Staatsangehörigkeit [Hitler's official application to end his Austrian citizenship]" (dalam bahaso German). NS-Archiv. 7 April 1925. http://www.ns-archiv.de/personen/hitler/oesterreich/staatsbuergerschaft.php. Diakses pado 13 April 2012. Sharkey, Joe, "Word for Word/The Case Against the Nazis; How Hitler's Forces Planned To Destroy German Christianity ", 13 Januari 2002. Diakses pado 7 Juni 2011. "Leni Riefenstahl ", The Daily Telegraph, (TMG), 10 September 2003. Diakses pado 14 Desember 2011. "Man of the Year ", Time Magazine, (Time), 2 Januari 1939. Diarsipkan dari aslinya, tanggal 7 June 2008. Diakses pado 22 Mai 2008. "Seven Years War? ", Time Magazine, (Time), 2 Oktober 1939. Diakses pado 30 Agustus 2008. "Germany: Second Revolution? ", Time Magazine, (Time), 2 Juli 1934. Diakses pado 17 Oktober 2011. "Poles: Victims of the Nazi Era: The Invasion and Occupation of Poland". ushmm.org. United States Holocaust Memorial Museum. http://www.ushmm.org/education/resource/poles/poles.php. Diakses pado 15 Desember 2011. "How many Jews were murdered in the Holocaust? How do we know? Do we have their names?". Yad Vashem. http://www1.yadvashem.org/yv/en/holocaust/resource_center/faq.asp. Diakses pado 10 Januari 2013. "Adolf Hitler". The Vault. FBI Records. http://vault.fbi.gov/adolf-hitler. "Hitler and his officers". World War II Movies in Color. WW2inColor. http://www.ww2incolor.com/gallery/movies/hitler_color.